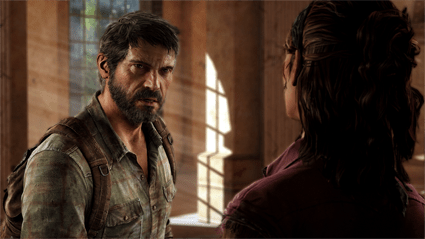 The Last of Us Review: An Overwhelmingly Awesome Experience - Reclusive Fox ""
The Last of Us has had the biggest and most positive write ups in the gaming industry EVER! It’s hard to browse the internet without a single advertisement, tweet or Facebook post raving on about it. Rightfully it deserves all the praise. If there has to be an example of a true masterpiece, well… The Last of Us dominates in all manner of gaming triumph. Sony owned Naughty Dog is proud of this title and it shows from immediate presentation that undoubtedly proves that this is PlayStation’s biggest and best exclusive title ever. Graphics are boasting at a maximum level throughout gameplay and cinematic sequences which tie together so seamlessly eat you up in a story that’s more than just engaging, you literally lose yourself in such a world that’s riddled with decaying city landscapes and characters that we can’t help but know and understand as if they were in the same room. 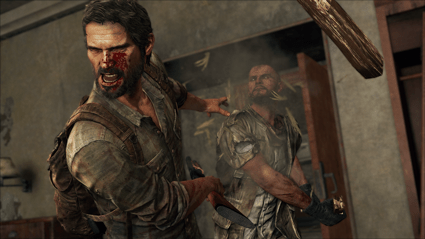 There has been talk of players who hadn’t owned a PS3 until The Last of Us hit shelves this weekend. They were tied to their PC gaming or bragging that Xbox 360 is the only console they’d ever actually play on because of this and that. The typical banter of a fanboy/girl. Seriously though those players are now coming to terms with what essentially is the biggest and foremost exclusive title to grace any console ever. Now that’s saying something. To have this much influence, to bring these people to a point where the only way they can get their hands on the awesome Ellie and Joel editions of the game is to either buy bundles from in store or borrow a friends PS3 and if that friend owns The Last of Us, they’d have to be beyond loyal to ever want to lend you all this within launch week. Trust me they’ll have hours of play and you won’t be seeing it for quite some time. You play the role of Joel who is a survivor of what appears to be a hopeless land of waste due to a horrific pandemic, spreading infection has caused the government to take military control and strayers to become hostile in their own parts of the city. Nothing is safe, whether it’s the brutally infected clickers that have been exposed for years with oozing fungal disfigurements, soldiers looking to extinguish anyone who is willing to break curfew or stragglers who have created their own law in their corrupted society where showing brute force is their means of survival. Their are communities of survivors who are willing to help and Joel will come across them in a world where trust is hard to demonstrate. Joel’s troubled past from the events of the outbreak are apparent throughout his struggles to survive but it’s not until you meet with Ellie that these characters really come to life. Ellie is a 14 year old who has been brought up in the apocalyptic world not knowing what it was like before the catastrophic events. The bonding between the two is absolutely beautiful, especially when it comes to on screen prompts that tell snippets of the story during the actual gameplay. You feel like you’re teaching her about the times when life was normal and at the same time you feel like you’re learning the story along with her. She’s a tough kid who believes she can handle herself during traumatic situations but Joel doesn’t see it that way. He is there to protect her in their journey to reach outer salvation and find answers as to what makes her so important. 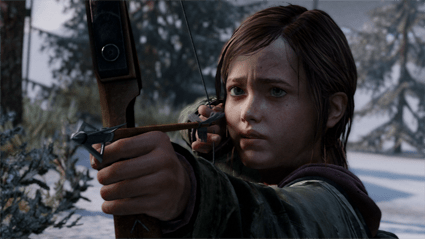 Any game could provide the level of characters that The Last of Us has created but very little have produced believable ones and most of that is down to the prodigious talent behind the voice acting. Never have I felt so engaged by character voice talent in a game quite like this. Every mutter, every sentence and every interaction between the cast in truth feels genuine. It feels as if it’s literally happening right before you. It’s not just the characters that make The Last of Us believable. Naughty Dogs efforts in creating a world where textures among clothing, walls, items and city landscapes are phenomenal. It pushes the limits of current gen visuals that would fool anyone to think it could have been next gen. The details of Joe’s ragged shirt are throughly detailed. Foliage, creeping ivy and other forms of plant life have taken control over the majority of the city walls. You could take a moment and count individual leaves if it wasn’t for the astounding gameplay that is to follow the dimly lit alleyways. No, I’ll admit I actually spent a great deal of time during our 18 hour playthrough just studying the level of detail The Last of Us has to offer. Along with the graphics it holds a remarkable sense of player interaction. Planks of wood used to reach across from roof to roof are literally a solid object with no intentions to rush the player into dropping it. The same goes for the ladders, it’s timed realistically and doesn’t come across lazy. A minor mechanic that no player would usually take notice of but it’s an addition to the believable characters, the believable setting to have believable weighty objects to manipulate. We love that. 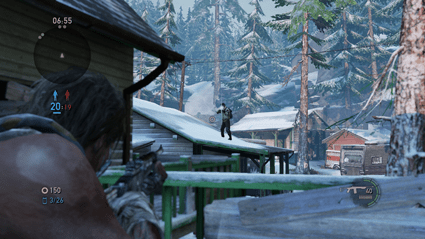 With all that is believable in The Last of Us combat proves to be just that combining scarce ammo for gunfights and hand to hand combat that connects fluidly amongst various enemies you’ll have to face. Each hit with the square button leaves you with a gratifying sense of Joel’s urgency to win a fight. Clickers and runners display grim death animations that can only be described as disgustful. Stabbing in the neck with a shiv or blasted their brains out with a well placed shotgun blast. I’d go ahead and say it’s satisfying but truthfully it’s stressful and I’d like to point out that’s not a bad thing. 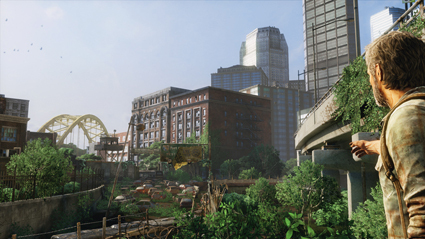 Last of Us looks gorgeous but the beauty is short lived through realisation of despair and tension. It’s easy to just pick up a weapon and go all out at these hideous creatures but with a lack of ammo you’re best bet is to get sneaky. It’s fantastic how The Last of Us can have you feeling fully loaded before facing off with a horde of enemies only to gain an understanding that 13 bullets for 13 clickers just simply isn’t enough. It throws an opportunity at you, to take advantage of the games awesome stealth features. Approach every threat with caution by using glass bottles and bricks to distract the enemy and sneak passed them. It’s unquestionably worth saving the ammo for the harder, BIGGER enemies. Coming back to the tension and genuine fear I faced with The Last of Us. All the stealth moments bring your heart to an utter stop. There’s this one particular area where it’s essential to make it through in absolute silence. With a low lit room and the sound right up, you’re going to experience a frightening ordeal even if you don’t face off with one of the infected. Making sure Ellie never gets into a scrap is also a hellacious experience but it’s that very experience that makes The Last of Us terrific. Be sure to always make use of Joel’s ability to listen in to where enemies are. Before entering a room or an area where activity may occur, you can quietly creep up and listen through walls. Enemies will be highlighted and from there it’s down to you whether you take them out quietly with a strangle hold or slip by unnoticed. Sometimes you’re left with no choice but to take the murderous approach and the player has to watch some grisly animations. These animations carry out in your death as well. One of the most horrific being the bloater. With a one hit kill it’ll clench onto Joel’s face, sliding its fingers into his mouth and ripping the jaw clean off. The camera work is marvellous. It delves deep into the fear and conflict that Joel faces especially when facing quick time events where panic mashing buttons brings you to a point of exhaustion. If that doesn’t bring you to a state of panic then running low on meds certainly will. To make health packs, shivs or produce upgrades you are going to need to find supplies. Supplies are dotted about all over the place from decrepit office drawers, empty garages to some of those hard to reach places that you’d least expect them to be. Creating a health kit relies on an area that’s clear of enemy contact. Joel reaches into his rucksack in order to sift through all the useless junk you’ve found only to turn it into the most useful health aid you desperately require. It’s all happening in real time and if you’re spotted by a savage runner you’d best get back up and swing with your equipped weapon fast! Those equipped weapons won’t withstand too much brutal combat though. Eventually they break resulting in sheer frantic desperation in order to find the next melee weapon available. It keeps you on your toes, always scavenging for scrap to create more obscure items from nail bombs to molotov cocktails. The gameplay thrives with the ability to swing in and out of cinematic sequences. 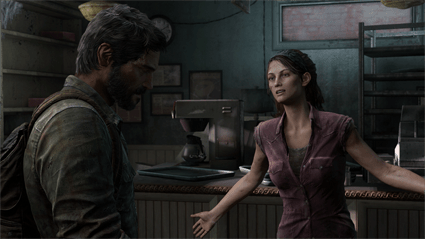 The connection between Joel and Ellie lasts throughout bringing an element of relief to an alarming moment of terror with reasonably timed humour. Ellie has some funny lines and thankfully it conveys a certain charm in between those moments of chaos, leaving you a little reassured and ready to move onwards with their journey. The single player has hours of joy and is worth more than a couple of playthroughs. A fair few unlocks to obtain too through collectible items. So we move swiftly onto the multiplayer side. Not really my cup of tea when it comes to groundbreaking single player action we’ve come to see within The Last of Us but earnestly Naughty Dog haven’t gone overboard with the MP and yet they have managed to bring one of the most interesting multiplayers we’ve played in a long time. Although it doesn’t have you coming back for more, lacking any real addiction or meaning to fight it still holds something unlike any other MP experience. It’s very minimal in terms of game modes. Only two in fact. Supply Raid which is simply to kill off the entire enemy team to win or Survivors where you’ll eliminate all enemies without respawn. Sounds like the typical additional multiplayer that comes with most games but trust us when we say this will have you in a nervous wreck. You can tell team mates are scared to make mistakes, you will be afraid to make them yourself and as most the mechanics are directly from the single player portion of Last of Us, meaning there’s stealth to be had when approaching enemy teams. Tackling human players is frightening when your team have all been dropped, leaving you pretty much by yourself to discover loot and inevitably die in the hands of your opponents. The most absorbing action that is taking place is the metagame. The ability to call in survivors through Facebook integration is neat. Any parts looted within your matches converts to supplies for your group of survivors. To keep the metagame forever going you’ll need to log in daily and rummage through for loot within the matches. Honestly though other than that it doesn’t offer the frequent frenzied multiplayer fun that players will sought after. A fair few unlocks for your customisable characters are there for the taking as you progress through the ranks but ultimately that’s it. 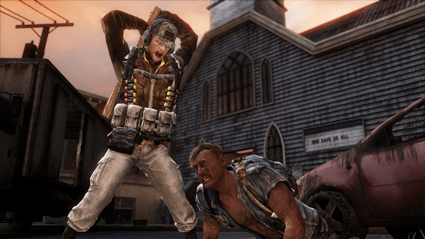 Team work is paramount when it comes to Last of Us multiplayer. Best as a team of friends like any other game obviously but without the team efforts it just becomes a big pile of death mess. Overall if you don’t fancy the multiplayer then you’re not missing out on much at all. The Last of Us is heavily aimed for the most exceptional single player experience, from story to gameplay and most importantly immersion. There hasn’t been a game like this in along time where you can actually feel every emotion brewing inside you. Fear, concern, urgency, relief, sadness, anger and so much more. Name every human emotion and you’re gonna feel it in this one…. except disappointment. 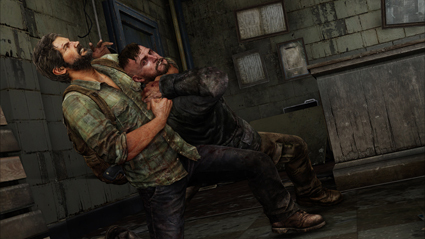 As a player you feel that every choice made by Joel is acceptable for the survival of Ellie and himself. You are behind him in every way even as a cold blooded killer. I’ve grown to love these characters more than any other in recent games. Naughty Dog have presented what is a true masterpiece behind every aspect you look at within a video game. Awesome narrative, superb voice talent, beautifully detailed surroundings, gripping gameplay and chilling suspense. Our reviews don’t usually rate games out of 10 but if we did the Last of Us would be beyond maximum! Easily GOTY! – NPCs tend to blow your cover when stealth really matters.